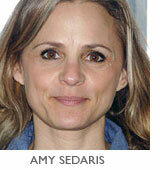 Amy Sedaris reveals why she prefers ugly people. This week, Salon sits down with actress and writer Amy Sedaris to discuss her forthcoming movie, "Strangers With Candy," a big-screen prequel to the late, lamented, boundary-pushing Comedy Central show on which she collaborated with fellow Second City veterans Stephen Colbert and Paul Dinello (both of whom co-wrote the movie and co-star in it as well; the latter also directs). In the film, which hits theaters on June 28, Sedaris reprises her role as Jerri Blank, a twitching, bad-haired former junkie, prostitute and jailbird who describes herself in the show's opening as "a boozer, a user and a loser." Of her attraction to the misfits and the ugly, Sedaris says, "It's harder for those people They have so much they're up against, and I'm more interested in that than the pretty girl." During the conversation, Dinello dropped in and answered a few questions about Colbert's now-infamous White House Correspondents' Association dinner speech, which Dinello helped write: "I think that context gave it more weight than was intended. Had the president gone 'ha, ha, ha!' and slapped his knee and everyone laughed, I don't think there would be a lot of discussion about it."